Based at our ancient woodland camp in Kent, this 1 day course has been put together for anyone who would like to learn 2 of the most important, but often overlooked, skills in bushcraft – how to make cordage and containers from the materials supplied to us by mother nature, such as nettles and various barks. You don’t have to be an avid bushcrafter to benefit from this course, anyone with an interest in the natural world or craft will leave with a new found respect for the versatility of many common plants and trees. This 1 day course looks at 2 different topics, cordage and containers. You’ll collect and prepare various plants and trees that can be used to make cordage, such as nettles, brambles, lime bast and the inner bark of sweet chestnut. How to plait them to make a more substantial piece of cordage. You’ll also harvest and prepare sweet chestnut inner bark to make a basket. We’ve got some that are now many years old and have seen us in good stead on our foraging trips. If time permits we’ll also make some shrink pots from birch bark, sewn together with some of the cordage that you made earlier and pinned using the thorns from hawthorn. This was my first course after learning skills solo for years, I knew it’d be good but was blown away on the day. The setup was fantastic, the camp of my dreams! The atmosphere was relaxed and friendly. Gary, Nicola and Bob were welcoming and engaging, so much so it eased my incredible nerves, if not for the introductions at the meeting point I’d have assumed everyone knew each other already, it was that friendly. The subject itself was explained and we got stuck in before I knew it, not a second of time was wasted. Tools that most of us in the game are used to were readily available if needed – bahco Laplanders, mora companions (and gloves for the nettles). Nicola provided a great spread for lunch, I was well happy to see a wild garlic relish! Hot drinks were available too. Throughout the day, Gary and Bob ensured everyone got encouragement and guidance, I can’t emphasise enough how easy going and encouraging the vibe was. A lot was achieved, I came away with a sense of real satisfaction. Sitting in my office now, sweet chestnut basket on show, I’m still smiley 2 days later. 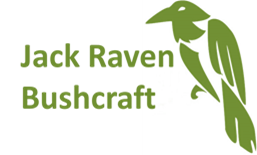 I’ll definitely be looking at more courses for future, and it will be with Jack Raven Bushcraft. I definitely was gifted the base of a skill I can now develop to higher levels. What a lovely day spent in the woods with good people. Gary and his team have such a wealth of information and the cordage and container skills are very valuable skills to aid a person in life. After creating a little basket of my own, I can really appreciate the time and effort that goes into making them. This is a course well worth going on. Thank you. Brilliant. Gary and his team are friendly and welcoming. On this course you will firstly learn how to prepare and make cordage from nettle stems. Then the bulk of the day is spent making a basket from Sweet Chestnut bark. You are shown how to source the raw material from a sweet chestnut log before doing it yourself. Splitting the bark from the log is an extremly pleasant occupation and the resulting lathes are both pleasing to the eye and smell. Then, under Gary's tuition, you weave a lovely little basket that has many uses. The whole day in conducted in delightful surroundings in the Jack Raven campsite. Lunch is provided and includes a number of tasty, locally foraged, foods. All in all, a great experience and great value for money. I love seeing these crafts passed on.